In the winter Art Show ’13 journal of the Russian Art & Paris, which will be published in two parts – the 1st and the 15th of February, we offer our readers a number of modern artists whose work deserves serious attention. The first part presents four contemporary artists. 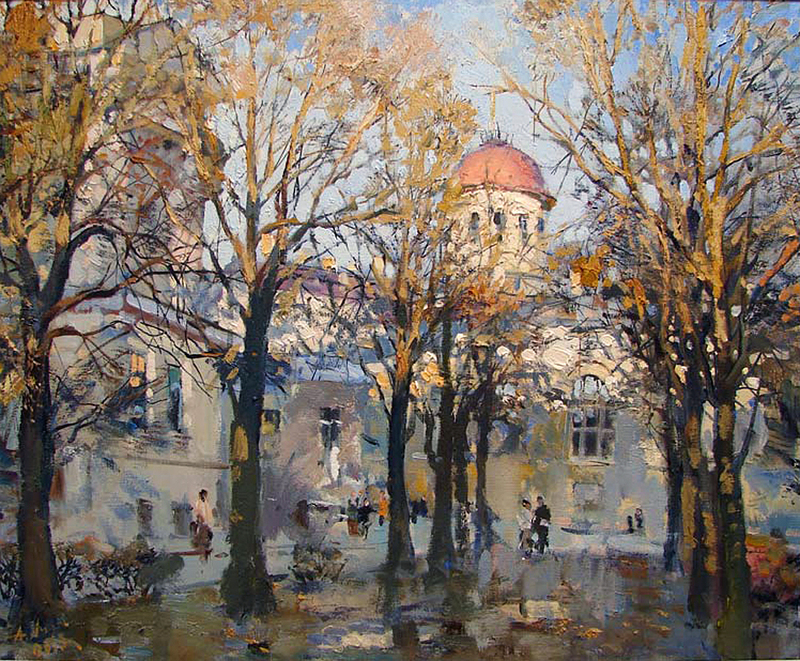 Peter Chekantzev, Associate Professor of the painting of the Moscow City Pedagogical University, is a artist of large scale and creative range. 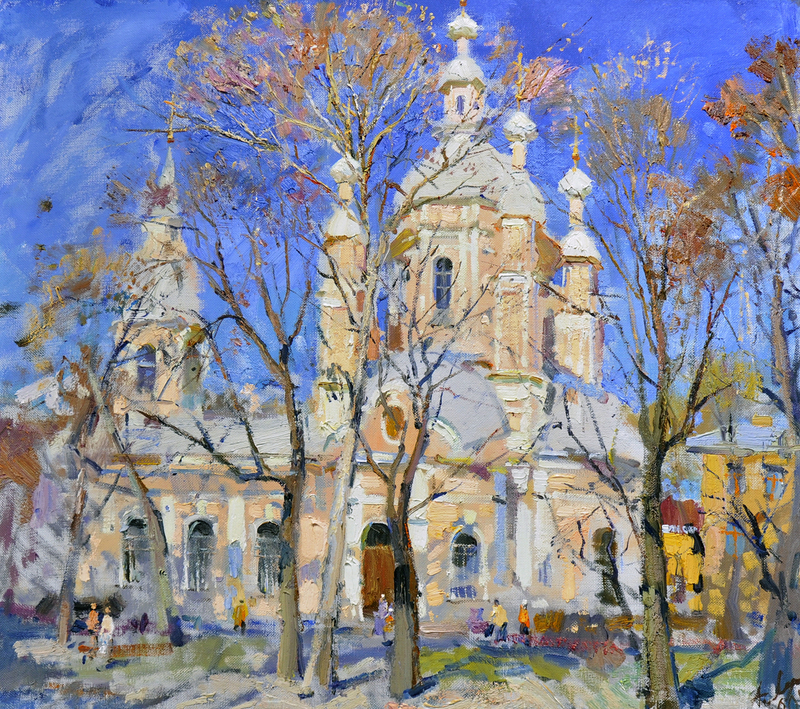 Anatoly Lukash, a Saint Petersburg artist, is one of the most interesting artists of contemporary landscape painting. 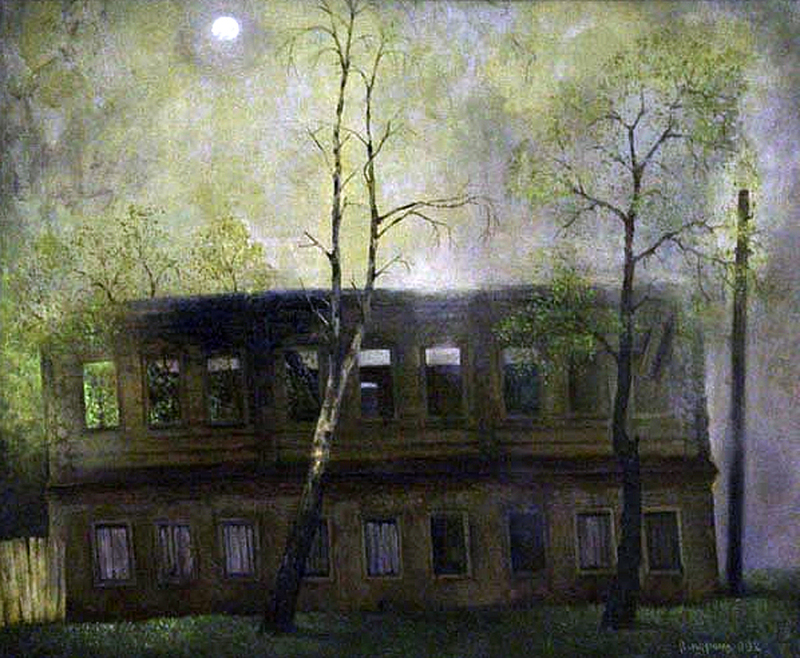 Vladimir Paroshin is a well-known and very popular Moscow artist whose artwork is concentrated in themes of urban landscape. 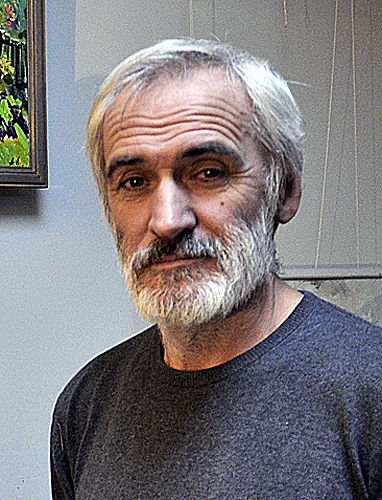 Aleksandr Pavlovets, a magnificent Dnepropetrovsk artist, has been successfully working in a wide range of genres. All of these excellent painters – mature masters, are now at the peak of their artistic and professional career. The creative work of artist Petr Chekantzev, multifaceted and multipolar, always exciting the viewer with the dramatic effect of sensations and with the temperament of its characteristics, is surprisingly frank. Frankness in art, is a extremely risky quality. Something objectively significant, of value to the viewer, must be created in the space of the canvas. A new meaning, a new world outlook, new emotions must be revealed to the viewer and understood by him. Understanding artwork is no easier than creating it. Comprehension of art, is a movement along the road, on which the artist is already walking towards you. Frankness implies that most of this difficult and sophisticated long road, the artist takes upon himself. 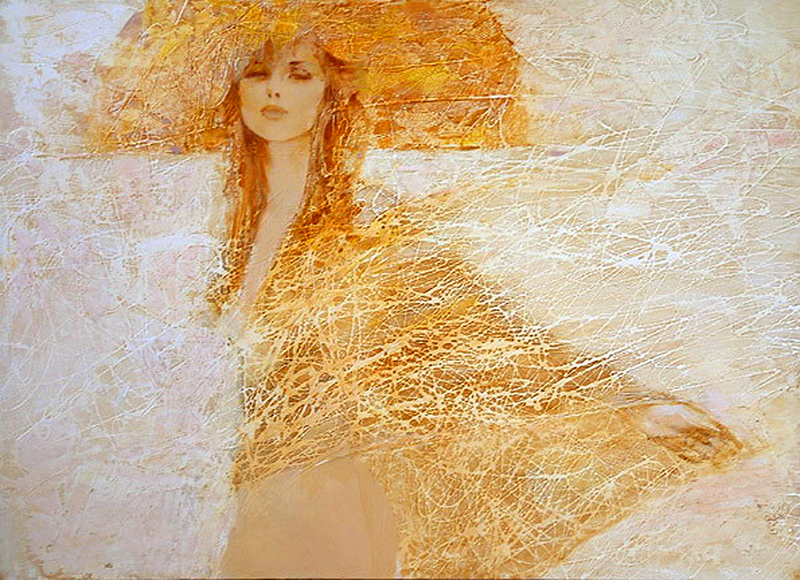 • A distinctive feature of the creative work of Petr Chekantzev is the amazing sense of time. Time – our days – in the works of this artist is real and tangible. It really is these days, and their recognizability by the audience is evidence of not just the authenticity and accuracy of the observations, but also the accuracy of the sensations. The artist sees the world in detail, letting his temperament to burst forth in color and tonal structures, but carefully preserving the authenticity of the human existence. 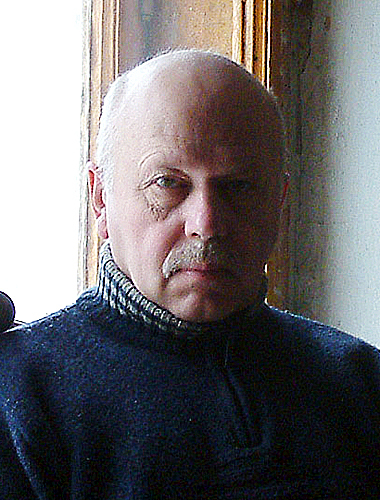 • The tuning fork of human presence is clearly heard in many artistic compositions of Petr Chekantzev. Let’s focus on a small-scale landscape “Silent Autumn”. 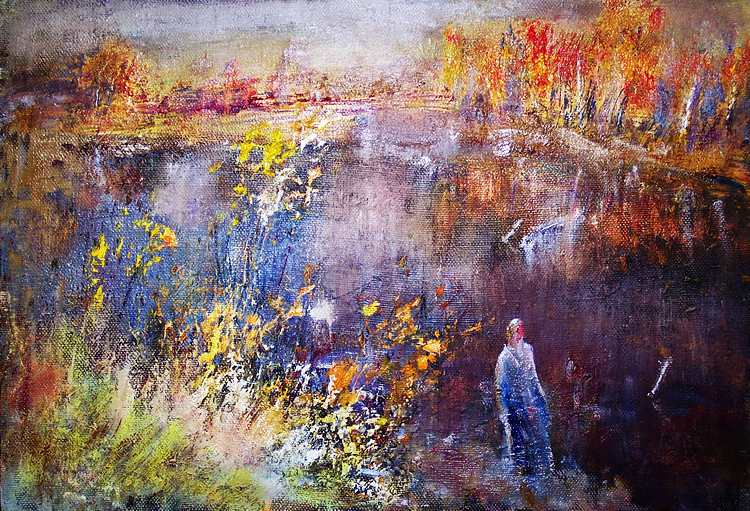 At first glance, the human figure in the lower part is no more than an entourage – a small detail with the purpose of slightly enlightening the beautiful autumn landscape. Analysis of tonal range, however, tells a different story. 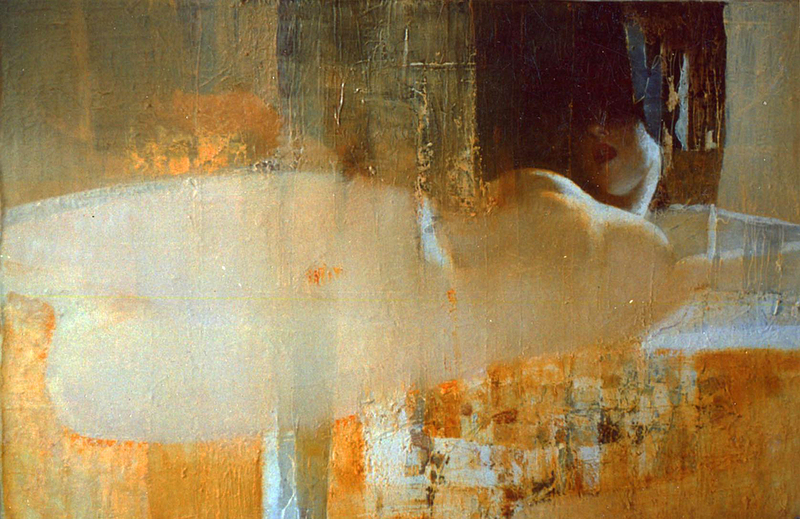 Tonal accents “lead” the viewer in a circle along the coast, locking onto the female silhouette. This is the center of meaning and plot of the composition. The landscape begins to take on a portrait characteristic – to record the state of the human soul, her complicated condition. Here all is in dissonance – a soft color of a far shore and explosive rhythms in the foreground, the bright autumn sky and the black depth of the lake. This is the reality in which a person believes. 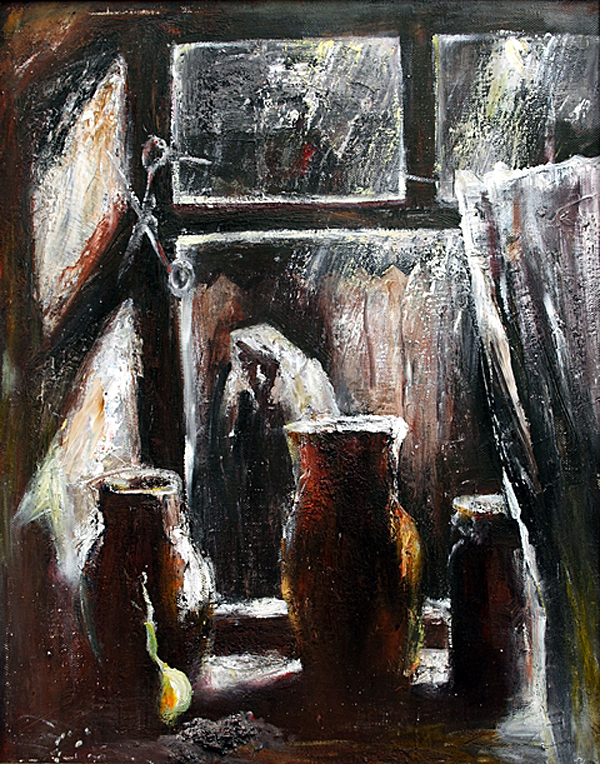 • The compositional structure “with a window” is traditionally difficult for painting. Well known are the problems faced by the artist in such compositions. Well known are also the possible solutions. In the composition “Raining”, the natural type of light – “contre” is developed to its maximum. Painting is approaching graphic art, thus depriving the artist to work with its main component – color. Maximally constricted space confirms the realized austerity of the artistic decision of this scene. Raining, the state where there is nothing but the rain. No space, no color, only cold gray light from the window. A small and very mundane plot grows to a large scale theme – “Friend! There is rain outside my window, worries and blessings are on the heart …” (M. Tsvetaeva). 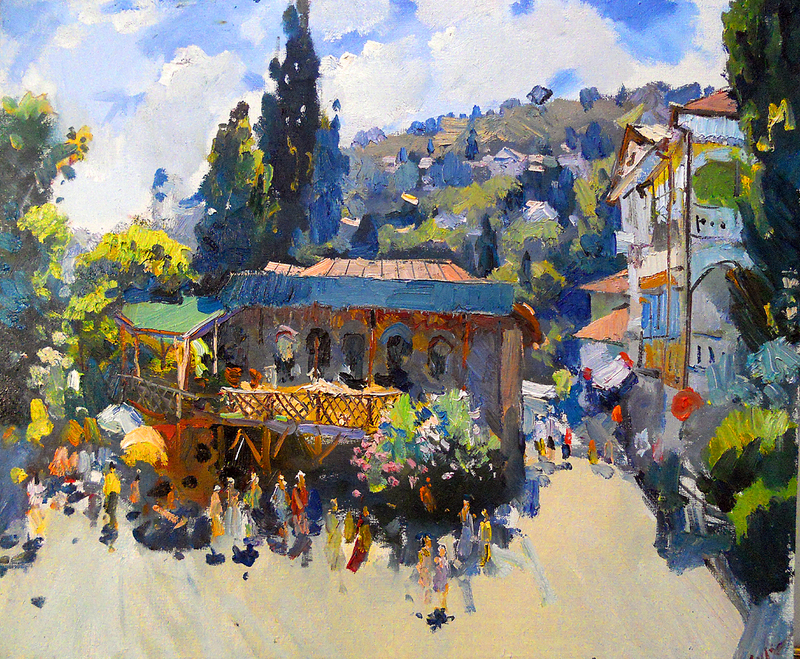 • A small landscape, with an unusual for paintings name – “Summer – is a little life.” In this title is the subtle irony of a Southerner who knows the seasonal rhythm of life in the coastal cities. Their festive carnival mood is fleeting, and most part of the year they are deserted and almost empty. But for those who are now sitting on the veranda, summer really is a whole life. Impressionism is obvious for this painting-sketch, but no less obvious is its psychology – that combination of qualities that transforms a natural sketch into a real work of fine art. Yes, each artist sees the world in his own way, and no one argues with this, but for real fine art, only one individual “vision” is not enough, we must also understand what to look for. The plot in artwork is a rather neutral category – it can be anything. Artists prefer a more specific term – a motive. Figuratively speaking, it is an artistic melody emerging from the color, rhythm, light, the artist’s own emotions, and God knows from what else. It is impossible to think up this tiny picturesque melody, it can only be seen and heard from the real life, and attempted to be built on the canvas. In this wonderful, and highly sophisticated landscape composition “Summer – is a little life” by contemporary painter Anatoly Lukash, all of this happened. • Looking through the artist’s painting works, noting their common qualities – high luminosity, compositional freshness, ease of execution, one should pay attention to an interesting detail. 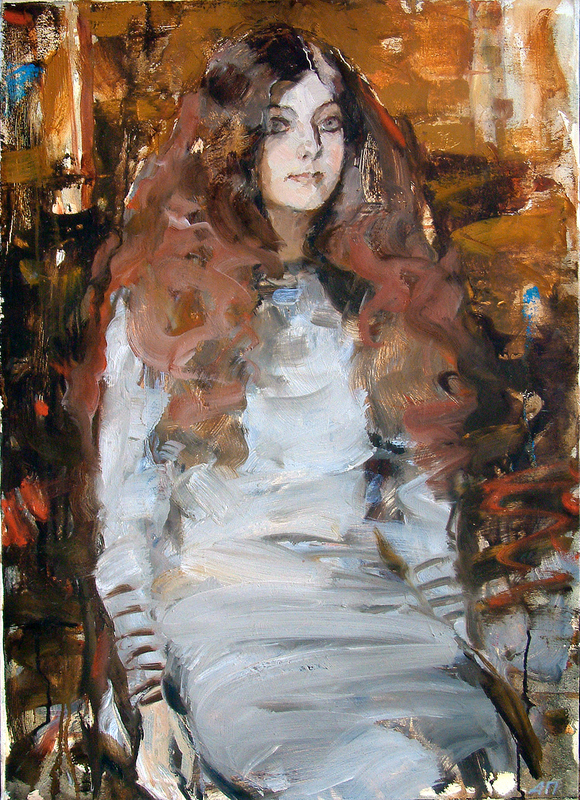 A. Lukash uses the word “etude” in the names of many of his artworks, which by their formal features – size, compositional complexity, and detail richness, does not refer to sketches, in the classical sense of the word. Furthermore, all artworks with this name can be considered in the most successful of his paintings. Apparently, the word etude, in this case, should be understood as a separate form of artwork with one, distinguished, intonation. This feature of the etude – concentration on the essential, has always attracted artists, but direct competition between the easel painting and painting-sketch forms has not yet arose. Few ventured to use the painting-sketch form outside of small, traditionally-sized sketch. Further development of this artistic form in the works of A. Lucash evokes an unconditional and very serious interest. It is enough to glance at the titles of paintings by artist Vladimir Paroshin to make it clear – before us is a very Moscow artist. 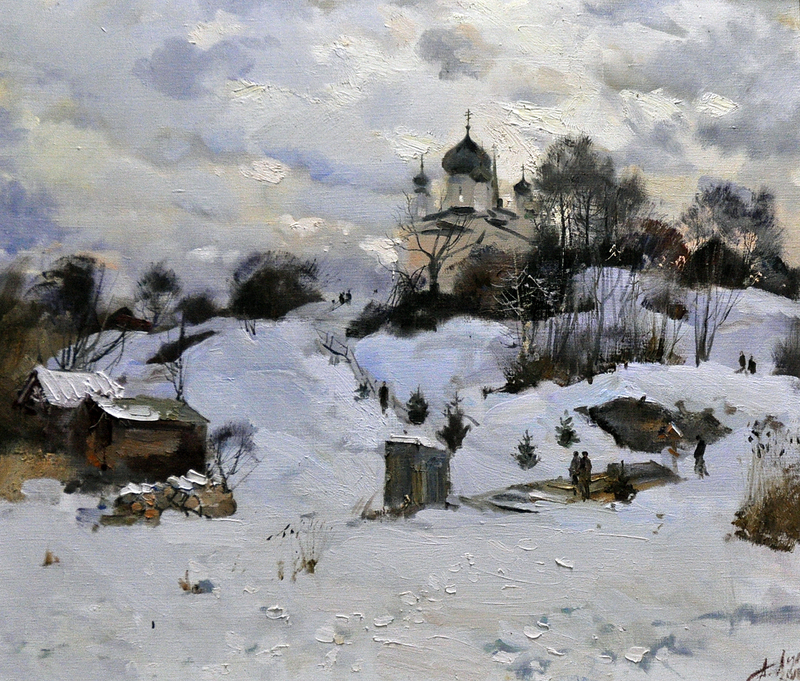 A Moscow artist not only in painting, but first of all, in his personal qualities, which are surprisingly in tune with the atmosphere of old Moscow and the Moscow landscape. Devotion to this city, love for it, formed (fortunately? or not?) the artistic dialectic of the painter. A rather complicated, and sometimes contradictory, – à la paroshin – dialectic relationship of real plot-space and surreal metaphysical painting. In this dialectic, as well as in classical tragedy, the death of the main character is inevitable. Possibly from here stems the internal drama and theatrical likeness of many, at first glance quiet and cozy, scenes by artist Vladimir Paroshin. • In Russia, it followed from the times of writer Nikolai Gogol, that outside yards and alleys were more interesting to artists than parade entrances. The life of the little man, a man from the street, that street itself – are the main subjects of Russian paintings of the nineteenth century. The interest in these subjects has not completely disappeared, what vanished was the urban environment that nourished it. 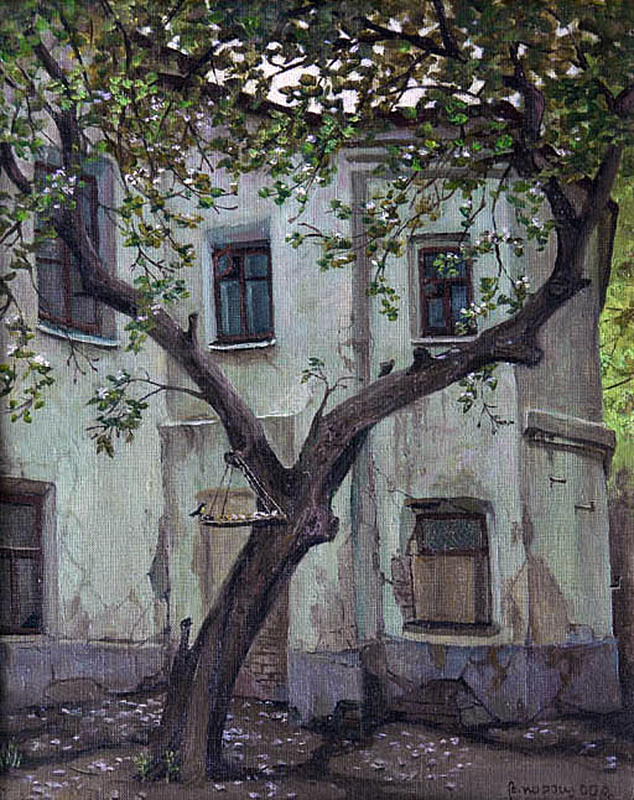 That space of cohabitation, in which intertwined the destinies of people, and the fate of things, and an old tree outside the window was part of the human biography. 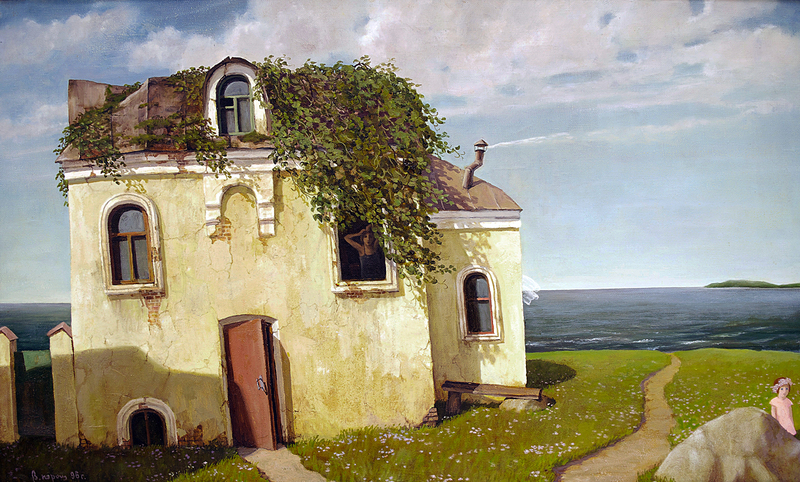 In the tradition of Russian realism is the love for characters of that story, which calls the artist to the canvas. 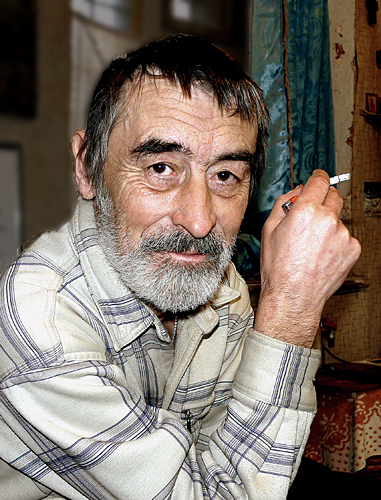 Connection with these traditions in the works of Vladimir Paroshin is obvious. In these same traditions the artist builds the relationship between his works and the viewer: artwork maximally revealed for empathy. 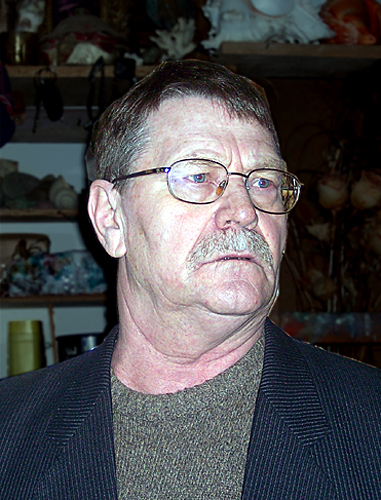 However, the traditions in the art of Vladimir Paroshin are viewed precisely as traditions. Obviously, he does not have direct predecessors in Russian painting. • The main compositional tool of the artist is the close-up view. Limited space creates the visual effect of stage portal – a closed, isolated from the world, action, revealed only in the direction of the viewer. This greatly enhances the emotional impulse placed by the author into the image. 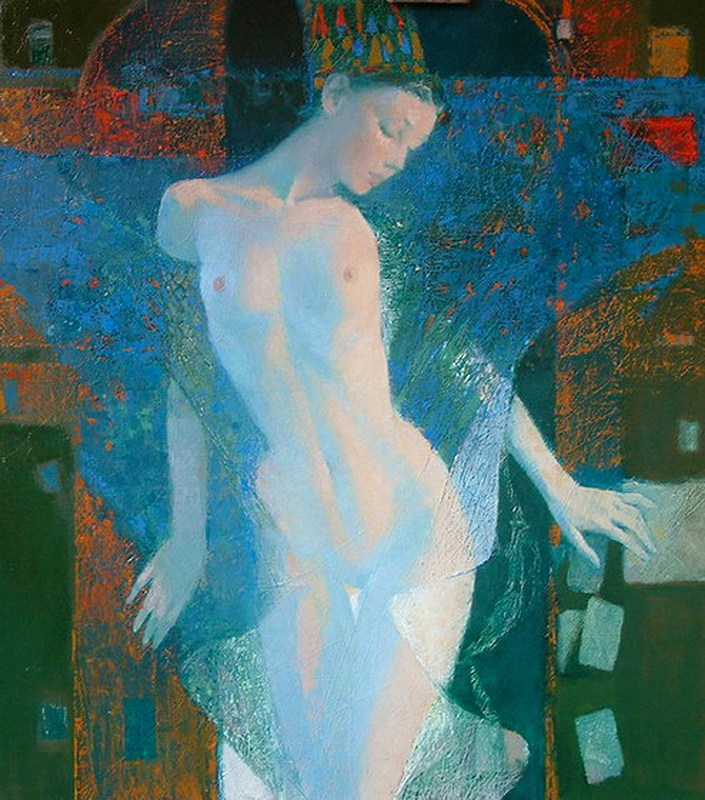 The accent of the emotional component of the composition, the hallmark of artworks by Vladimir Paroshin, leaves its mark on the style of his works as well. Asceticism of the artistic methods and the laconic, almost graphical art language are the main features of the style of the artist. 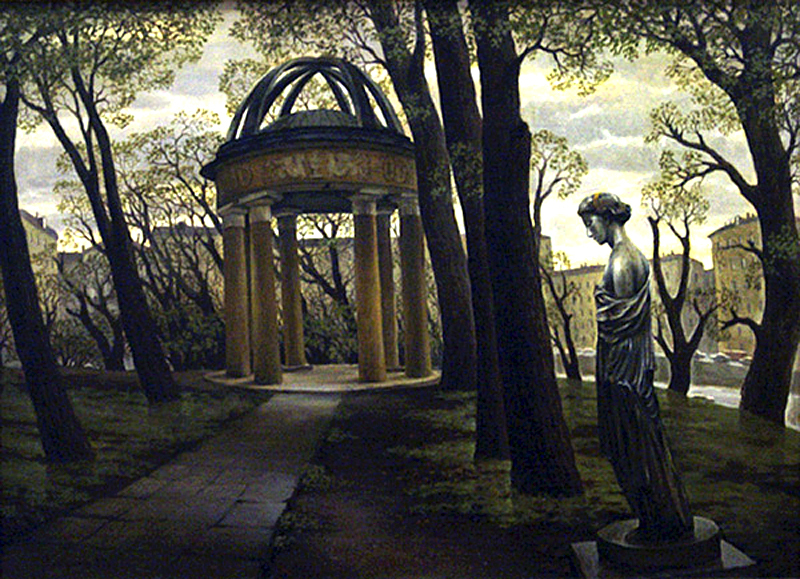 A mystical carousel of trees and houses around the empty colonnades of a rotunda (“Rotunda”), a tipping dark horizon in the “Prelude”, a dream coming alive in the very emotional composition “The County” – demonstrate the range of artistic possibilities of the style of Vladimir Paroshin. To give a definition of artistic taste is not easy. It’s not so much for the lack of a tuning fork as in their abundance. Every single historical epoch had its tuning fork, and sometimes more than one. Our time is not an exception – there are plenty of tuning forks, and the loudest one is not necessarily the most accurate. 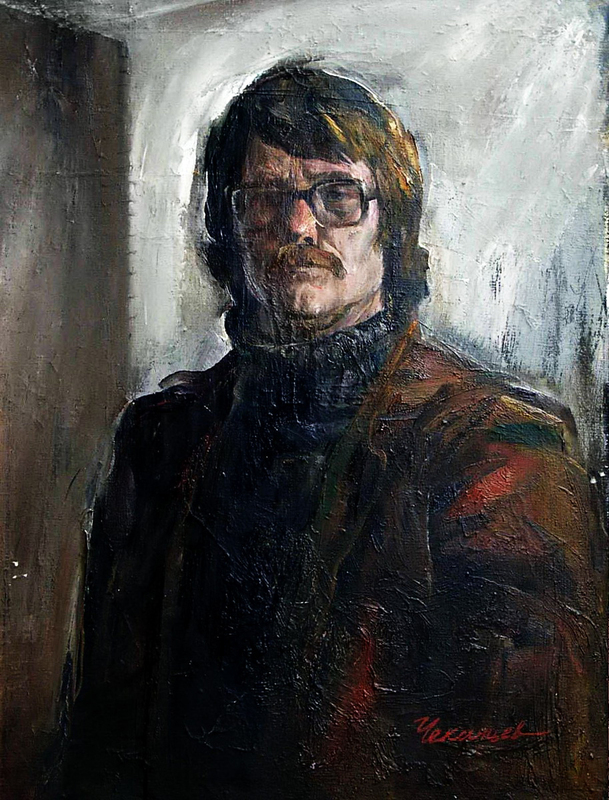 The tuning fork of the artistic taste of contemporary painter Aleksandr Pavlovets sounds restrained, sometimes very quiet, but it is worth listening to. In the soft music of his works, there are very many precise notes. 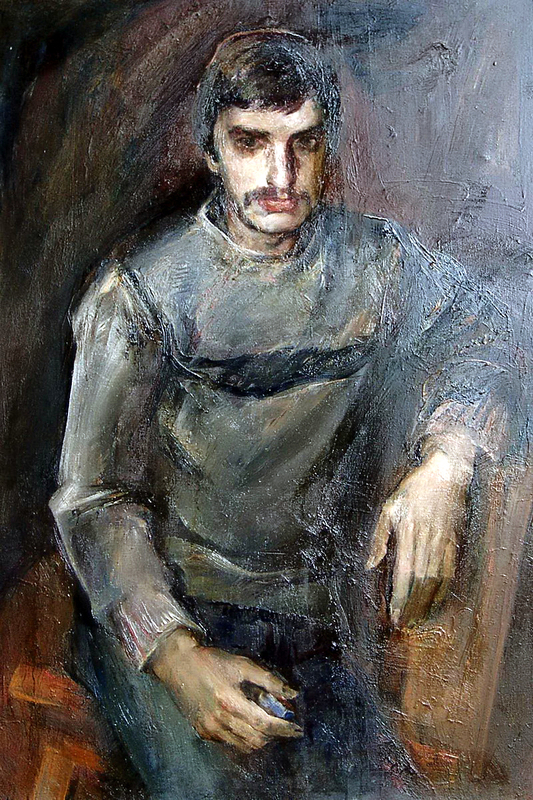 • In delineating the space of the artistic images of Aleksandr Pavlovets, in finding a designation for this space, the simple word “harmony” seems natural, but not sufficient. An aura of tranquility in still life is replaced by an aura of tense silence in the portraits of women. An aura of coloristic hues interweaves with an aura of light and shadow. Compositional structures are distinct and laconic. The motions of live characters are almost always completed. The openness of female images is deceptive, their lips are tightly sealed. Harmony of rest? The harmony of silence? Yes, probably, but still something more. • How can the mystery of Danae capture the contemporary artist, a mature man of the twenty-first century? The charm of an ancient myth? But it has been retold a thousand times and implemented in hundreds of paintings. Interest in ancient Greek history? But the painting “Danae” by Aleksandr Pavlovets is devoid of any historical attributes, his Danae is timeless. Perhaps most importantly, it is the presence of the mystery itself, a mystery of the divine in the earth. The compositional decision of the artist is temperamental and sudden, the main character of the painting is made to be not Danae, but Zeus. No, it’s not just about the shimmering of verticals and gold color scheme (Zeus came to Danae in the form of a shower of gold). We look upon Danae through the eyes of Zeus, on canvas is his emotional order, his invisible presence. He is located at the point from which the viewer sees Danae. The sharply-modern interpretation of the plot is psychologically daring, and no less daring is the painting itself, almost fresco-like by its nature. The composition arranges the image, and the image revealing the meaning. Impeccable graphic slenderness of a sophisticated foreshortening of the female figure, is the only classical element of this artwork. Everything else is art of our time.